This is a round shaped icon. This late 16th century Russian icon (1580-90) is from Sol’vycegodsk Annunciation Cathedral. Above, God sitting on a throne is creating Adam as a small figure and showing this creation to an angel in the midst of Paradise, while other angels look on in wonder. 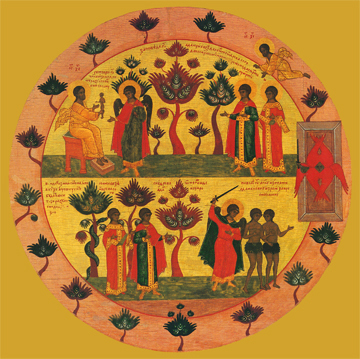 The Tree of Life and the Tree of the Knowledge of Good and Evil are seen between them in the central background. Below, Adam and Eve are being banished from the fragrant and abundant Garden of Eden that was created for them, as an angel drives them towards the door for their expulsion. Satan, the Adversary, who tempted Eve to disobey God, is seen in the form of a serpent entwined about another tree near the Tree of Life and the Tree of the Knowledge of Good and Evil. Here angels again look on, but not with wonder this time, but with sorrow at the fall from grace and a carefree life that the choices of Adam and Eve have caused. A flaming Seraphim stands guard at the door so that Adam and Eve and their descendants cannot enter Paradise again in their present unrepentant and fallen state. God will again open this door to them just after He dies on Golgotha. Open to us also, O Lord!